Dramatic eye makeup can make––and break––an evening look. Done well, and you leave your date speechless. Done badly, you can make him (or her!) just as speechless––for all the wrong reasons. So if you want to turn heads, why not learn how to do it the right way? Whether you're going for smokey eyes, bright eyes or long, long lashes, you're going to want these tools to make your eyes stand out. Eye Makeup Primer. Primer keeps your eye makeup on your lid. It keeps eyeshadow and eyeliner from running or smudging, even if you're sweating or in a humid climate. Not deep sea diving, though, unless you're wearing goggles. Eye Makeup Brushes. Yes, I know they give you that little white sponge on a stick with every eye makeup kit. There's a reason it's free, you know! A good brush kit might be more expensive, but it will save you time, and it can make all the difference between looking like a sultry temptress and a sulky teen. Eyeliner. If you're new to using eyeliner, skip the liquid stuff and use an eye pencil. If the idea of putting a sharp object near your eyeball freaks you out––don't sweat it. But try to go for more colorful dramatic eye makeup––smokey eyes aren't smokey eyes without eyeliner. photo by courtney murray rhodes. Dramatic eyeshadows. It's very hard to pull off dramatic eye makeup in beige and light mauve. 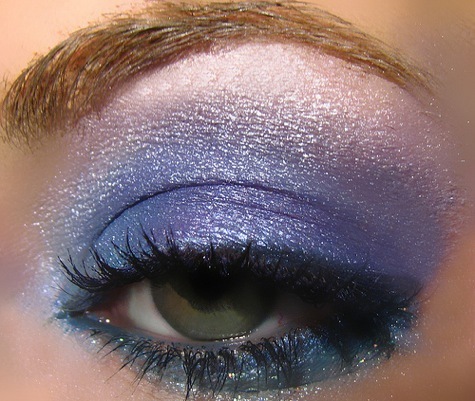 Try to go for a few shades darker than what you're used to, or else a number of similar, brightly colored eyeshadows. Above all, though, make sure the eyeshadow flatters your skin tone; a dramatic color in the wrong shade can seriously cramp your style. Mascara. You may think your lashes are too sparse, too short or too straight. But a good mascara can work wonders. Check out our article, What's the best mascara?, for some insight into good quality mascaras that can be used for day and dramatic eye makeup. Try to get your eyeshadow to match (or complement) your hair color. If you have brown hair, browns and blues will likely look good on you. Blondes look great in shades of purple. Redheads look good in greens; if you're going for a sultry look, why not try a dark, python green? People with black hair typically look good in black, of course. Also try to get your eye makeup to match your eye color. If it matches your color directly, or contrasts with it, try it out! If you're very fair, heaps of black eye makeup won't look so great on you unless you have black hair. Even then––keep the dark makeup to a minimum or find lighter shades, such as a greyish black. Bright colors, however, might be another good way to bring out your eyes. If you're asian, smokey eye probably looks a-ma-zing on you! Read our article on smokey eye makeup to learn how to apply eyeshadow on monolid eyes. 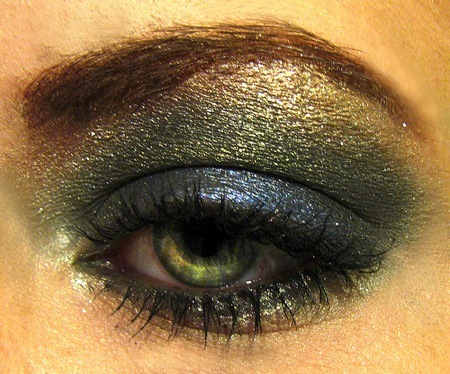 Dramatic, smokey eyes also looks great on latinas and women with olive-toned complexions. Ask a makeup artist for her opinion. If you're african or very dark-skinned, why not experiment with light, bright colors? Smokey eyes look good on almost anyone (as you've probably guessed from the above list) but it might be fun to mix it up a little bit. If this list made you more confused after reading it than before––I apologize. I would still recommend a consultation with a makeup artist; minute differences in skin tone can make different colors "pop" on you; these colors might be different from even your siblings. The purpose of dramatic eye makeup is to draw attention to your eyes. De-emphasize your lips, using a more or less neutral lipstick, perhaps with a clear gloss. If you're unsure of your technique, check out our tutorials section, as well as the articles How to Apply Mascara andHow to Remove Mascara.